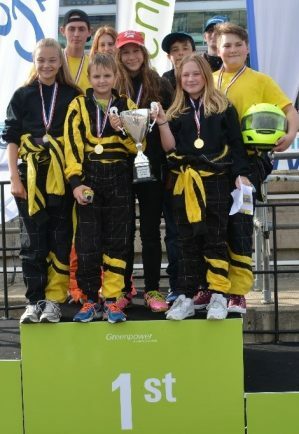 BROMSGROVE School’s racing team were crowned champions of the World Kitcar Finals held at the Rockingham Motor Speedway. The team, consisting of pupils from Year 9 to 12, arrived early at the Northamptonshire circuit to get to grips with their kitcar called ‘The Chicken’. After completing their set up for the race, ‘The Chicken’ lined up on the front row alongside rivals ‘Megazord’ from Bristol Grammar School with the aim of beating the track record for fastest speed, fastest lap and furthest distance. The team fulfilled their aims by setting a top speed of 29mph, nearly 2mph more than the previous record. They also set a new lap time record of three minutes and three seconds whilst setting a record distance of 36.8 miles.